We have discussed slips and falls on this blog in the past, but I thought it deserved its own post. Slips and falls are a serious problem and source of insurance claims at salons and spas. 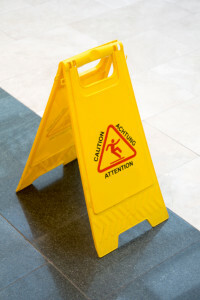 Think about it: salon and spa environments are perfect for slip and fall accidents. There is constant foot traffic in and out of and within these facilities, and floors may be damp or covered with hair clippings. Staff members try to stay on top of sweeping and mopping, but that can be tough on a busy day—especially a busy rainy or snowy day. But, you may be thinking, it’s just a little tumble, right? Unfortunately, that isn’t always the case. People can be seriously hurt by slipping and falling. And even people who take a spill and do not sustain a serious injury may try to take legal action against a business. If they haven’t done so recently, salon and spa managers and owners should evaluate their facility’s slip and fall hazards. But one time isn’t enough. Missing or broken tiles, linoleum, floorboards or stairs need to be fixed on a regular basis. At doorways, high-traffic hallways and around salon booths, ensure non-skid mats are being used. Encourage staff members to take up a broom when they have a lull between customers. Many businesses already do this, but those that do not may want to consider offering non-slip footwear to customers. As the saying goes, accidents do happen. We recommend instituting an incident management program for dealing with all sorts of accidents and mishaps at salons and spas, from allergic reactions from hair color to cuts from manicure mishaps. These programs—which include training, documentation and awareness—help manage slip and fall incidents, as well. An important aspect of an incident response program is counseling employees how to react to accidents. The rule of thumb is don’t panic. A manager should take charge of the situation quietly and patiently. If a customer falls and scrapes her elbow, simply apply antiseptic and a bandage. If she broke a bone and requires medical attention, keep her comfortable and encourage staff to remain calm until emergency responders arrive. Never attempt to treat a serious injury yourself. Documenting the details while they are still fresh in the mind can make all the difference in defending a claim. Even after the report has been filed away, staff should refrain from discussing details of an accident with customers or even co-workers. For salon and spa owners and managers who have never dealt with a slip and fall incident, this may not seem an immediate concern. But we see enough claims from slips and falls to take this problem seriously. Of course, the goal of awareness, monitoring, repairing and planning is to make this problem a little less serious. After all, we want to keep salon and spa experiences relaxing and fun.